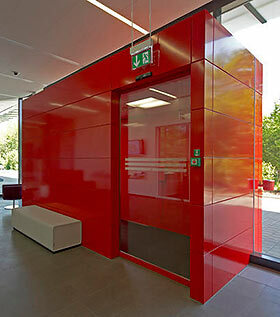 Automatic doors open and invite people into the building at pre-defined times. But at other times they should deny access. With its doors tested to resistance levels 2 and 3 of EN1627, TORMAX offers solutions which make burglaries practically impossible, thus not only protecting valuables but effectively restricting vandalism. RC2= resistance time 3 minutes: the opportunist criminal attempts to break open the locked and bolted door with simple tools such as a screw-driver, pliers and wedge. RC3= resistance time 5 minutes: the professional criminal attempts to break open the locked and bolted door with a broader screw-driver and a crowbar.